A Natural Stain Remover works on grass, red wine, ketchup, blood, grease, underarm stains, and so much more. Vegan, biodegradable and Palm Oil free. Living Naturally Natural Stain Remover works on grass, red wine, ketchup, blood, grease, underarm stains, and so much more. Even the most stubborn stains are washed away. Ordinary stain removers contain chemical detergents, but this Natural Stain Remover is real soap, made with all-natural, biodegradable ingredients. There are no artificial dyes or perfumes, just the fresh, clean scent of natural eucalyptus and the deodorizing power of litsea. Will not discolour clothes or fabrics. 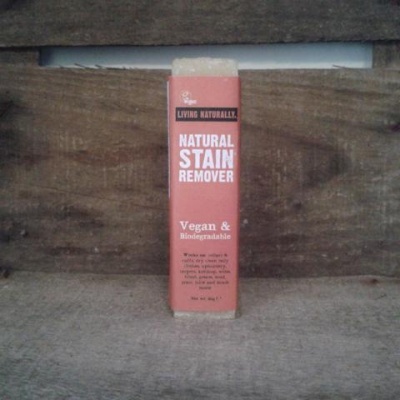 This natural stain remover is Vegan, biodegradable and Palm Oil free. FOR CARPETS AND UPHOLSTERY: Wet bar and rub into a sponge, apply soapy sponge directly onto stain, remove excess suds with damp cloth and let dry. I used this lovely stain remover for nosebleed stain on bed linen, mattress protector, pillow & duvet (yes, I had a busy day!!). I rinsed the stained area with cold tap water, then rubbed this stain remover (like I used to do with vanish soap), then put them in with my usual soap nuts in the washing machine. Blood stain has all gone in 1 wash. Easy!! This little stain remover stick works fabulously. It smells like citrus and sherbet, a really pleasant scent. I tend to soak the garment in question, then rub the stick over the stain, building a layer of lather and then leave it soak in for a few hours. When I come back to it, the stain has completely gone. I'd absolutely recommend this. This stain remover is great!! It works perfectly on any kind of stain and it seems to last forever! I will definitely buy it again and I would suggest it to anyone looking for a natural but effective solution to remove stains.